Today’s Gold Ribbon Hero is Ms. Kendra Sparby, an outstanding young woman from Minnesota committed to making a difference in the lives of children battling childhood cancer! A recent high school graduate and incoming freshman at the University of Minnesota Duluth, Ms. Sparby has been actively advocating on behalf of American Childhood Cancer Organization and kids with cancer for several years now, hosting numerous PJammin® parties at local schools, selling ACCO PediCURE kits, and raising money online in support of ACCO’s mission to develop and provide, free of charge, educational resources and learning tools to families facing a childhood cancer diagnosis. Many of our Gold Ribbon Heroes are the courageous and amazing kids fighting childhood cancer and the late effects that impact the lives of all-too-many childhood cancer survivors. Yet it is so important to highlight and celebrate Heroes like Kendra, who volunteer their time and energy to improve the lives of kids with cancer. If you would like to nominate a Gold Ribbon Hero in your life—someone who has gone out of their way to help, support, and/or advocate for children with cancer in your community—please visit ACCO’s website to complete a nomination form. Kendra’s drive to advocate for kids with cancer began in middle school when her friend Grace Woods was diagnosed with cancer in seventh grade. To support Grace during her fight against cancer, Kendra began selling t-shirts at local high school football games. Unfortunately, Grace lost her fight with cancer on September 4, 2015 at the age of 16. Yet Kendra’s determination to honor Grace’s memory and continue fighting on behalf of all kids with cancer only grew stronger! As an advocate and ambassador for ACCO, Kendra now travels to local schools to host PJammin® events and mini-class PJammin® parties. A signature fundraising mechanism for ACCO, these events also serve to teach kids and adults alike about the impact of childhood cancer on families facing this terrible disease. For instance, participants in PJammin® events wear PJs to symbolize the days, weeks, and even months that kids battling cancer spend in hospital wards wearing PJs or hospital gowns. In addition to hosting PJammin® events, Kendra has sold more than 80 PediCURE kits. Kendra’s other fundraising initiatives include a 12-12-12 Challenge which encourages participants to participate in 12 days of physical activity (with 12 exercises each day) OR donate $12 to ACCO, or even do both to honor the 12,000 children who lose their lives to cancer every year. In 2016, Kendra raised $1,100 for ACCO and she is hoping to raise a similar amount this year. And she is well on her way to achieving this incredible goal: since February, she has already raised $980! If you would like to make a donation to Kendra’s fundraiser, we invite you to do through her fundraising page at https://give.acco.org/campaign/kendra-sparby/c122630. 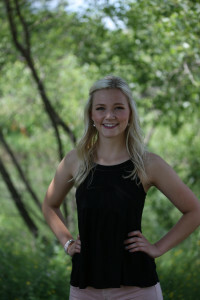 Kendra graduated from high school in May 2017 and will attend the University of Minnesota Duluth in the fall, where she hopes to major in biology. She is an active and talented figure skater, and is a double gold medalist with the US Figure Skating Association. She hopes to compete as part of the University of Minnesota’s synchronized skating team. Kendra is also a successful participant in the Miss America Organization. As the 2016 Miss Heart of the Lakes Outstanding Teen, she placed in the top five in this year’s Miss Minnesota pageant! This is the culmination of a very successful pageant career, having previously won Miss Princess Altona in 2013, Miss Moorhead’s Outstanding Teen in 2014, and Miss Heart of the Lakes Outstanding Teen in 2015. Kendra has used her success in the Miss America Organization to highlight the critical need to raise awareness about childhood cancer and advocate on behalf of children fighting cancer across the country. We would like to take this opportunity to thank Kendra for her amazing work on behalf of ACCO and kids with cancer!